LA Partnership is a public-private collaboration of the country’s largest private foundations, family foundations, the Los Angeles Area Chamber of Commerce, First 5 LA, and key government agencies that acts as a catalyst to magnify resources that advances the lifelong health and well-being of LA County children. 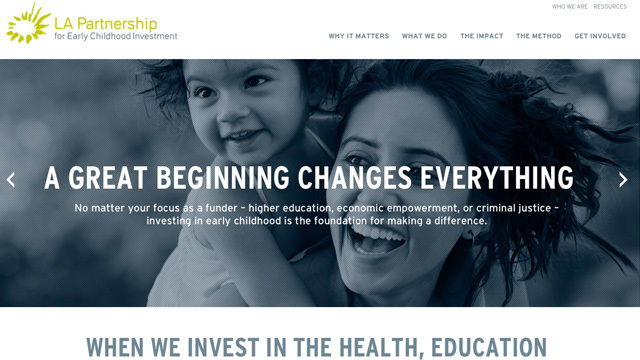 When they asked for a website overhaul, they got a visually impactful, engaging site that balances eye-candy with a professional-grade philanthropic message and request for involvement. DigitalMarvel performed HTML, CSS and PHP coding.Visit the site here.